They say that 'those who can't do, teach.' If that is true, then I am in a quandry. Because I love to teach. I hope, however, that I can actually DO at the same time! I had the rather exhausting pleasure of running my Creative Flash Photography Workshop at Montsalvat on Saturday. My flash workshop is perhaps the most difficult to run, seeing as there are only a few flashguns that can be accessed off camera and some rather eager photographers wanting to take as many photographs of our models as possible. But all seems to go well enough and everyone gets their share of a good time and good photographs. I have more workshops to come at this fabulous location so let me know if you want to come and join the fun! To see what some of those who have come accomplish, come to the Flickr site dedicated to my workshops and to those who attend. Click here. I have a new series of workshops announced. For more information, click here or email me directly. 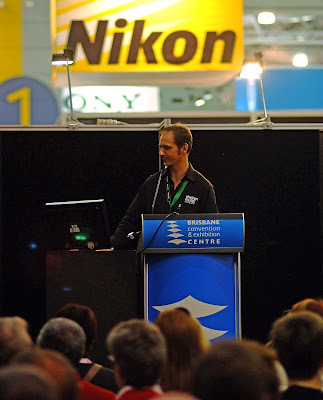 Well, after much work and preparation, the 2008 Imaging and Technology Expo in Brisbane is over. It was in 1997 that I first came to the Expo as editor of a magazine, and 11 years later I am still in that role. Although this year I must admit to being able to shake alot more hands than I did in 1997. I suppose over that period of time you get to know a few people and you get to be known. It has been an interesting 12 year ride since it all began. I was pleased to be able to present a session for the Photo Marketing Association and three tutorial sessions for the public. We were able to convince several people to become a member of our Five Minute Photographer family and of course we gave away about 1000 copies of Total Image, Better Pictures and PhotoPlus.